Russia is doing many things right, and we need to learn from them — In 25 years, Russia built over 25,000 churches, they increased their opposition to the LGBT movement, and they made abortion rates plummet. The faith of a nation shapes the destiny of a nation. Here is a way we can contribute . . .
Fr. Joseph is the editor of Russian Faith. You can write him at [email protected]. I want to thank the publisher, Charles Bausman, for his gracious introduction. I have been thankful to accept his offer to serve as editor of Russian Faith. Taking the reins of this publication is both an incredible blessing, and an enormous responsibility. I owe a debt of gratitude to all the people who put such a tremendous effort into making the Russian Faith website a reality. All these efforts are important contributions in the culture war. A host of forces, both good and bad, are vying for our attention, and for the attention of our children. It is imperative that we clearly teach the timeless truths of the Christian Faith, and we need to do it in a professional way, in multiple languages, via sight, sound, and text. The Russian Faith website is helping make this happen. Russian Faith news stories are being picked up by numerous websites, including LewRockwell, OrthoChristian, Pravmir, Russia Insider, The Right Edition, The Catalog of Good Deeds, The Remnant, and a number of bloggers both home and abroad. Priests are even quoting Russian Faith articles in church bulletins on the local parish level. We are grateful for the countless kind messages, comments, and emails that we receive from our readers on a regular basis. You, the reader, are the reason why this website exists. I am thankful for your love of Russian Faith, and I ask for your continued prayers. We will continue upholding our original mission, telling the amazing story of Christianity's unprecedented growth and revival in Russia. At a time when Christianity is being viciously attacked in both America and western Europe, and when anti-Russian propaganda is at an all-time high, we believe this is an important story that needs to be told. Over the past 25 years, Russia has been building three churches a day, for a total of over 25,000 new Orthodox churches. During the same period of time, Russian society has increased its opposition to the homosexual movement, abortion rates have plummeted, and today, Russia's population is rising. The faith of a nation influences the destiny of a nation. Russia is doing a lot of things right, and we need to learn from them. 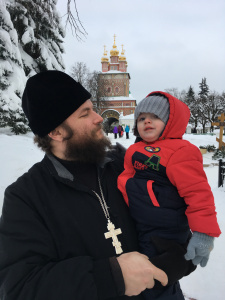 Another goal is to share the Orthodox Christian Faith with people throughout the world,whether in America, western Europe, or elsewhere. Orthodoxy is the true, original European form of Christianity, and we need to bring it back to the broader masses of people in western society. Creating English subtitles for Christian movies, children's programs, and TV shows. All of these tasks require funding. For this continued work to be possible, we will have to substantially increase donation revenues. Our community has done a great job so far, but our readership is still relatively small, and we are falling short of meeting our donation needs. We need to rely more on a few larger donors to make Russian Faith what it can be. If you are interested in making larger gifts, please contact me directly at the email above. If you haven’t contributed yet, please do. Every amount helps, and we need all the help we can get. Stay tuned for further announcements from the staff regarding new initiatives, and where we are headed.